The iPad 3 is coming out in March, and like its predecessors, it will surely be a huge success. But every time a new generation of an Apple gadget comes out, the previous ones flood the secondary markets, usually followed by massive price drops. Like iPads 1 today, iPads 2 will probably be quite inexpensive in the following weeks, when we'll have a new item on our with list. This may not be a really a big problem for Apple, since their business model of ultra-fast product cycles obviously works, but still, the idea of being able to sell more than one product of the same line to a single person could hold quite a few benefits. Let's take a look. I remember a really cool anecdote about an intern, who was bragging to the management of a pharmaceutical corporation he would be able to double the sales of their shampoo without any costs. Of course, no one believed him (or her), but the idea was very simple and effective. He said the company should simply put a "Wash twice" instruction to the back of the bottle, making people consume twice as much of it. The sales probably didn't double, but it's still a brilliant idea. This third group of people is who we are after, by offering them another added value to buy the new iPad without making them sell the old one. Owning two iPads at once? Why not. While the iPad and most other mobile devices support software multitasking, having more applications opened and one on the screen isn't real multitasking for the user. Split screen apps could solve this issue, but the screen size isn't that big. 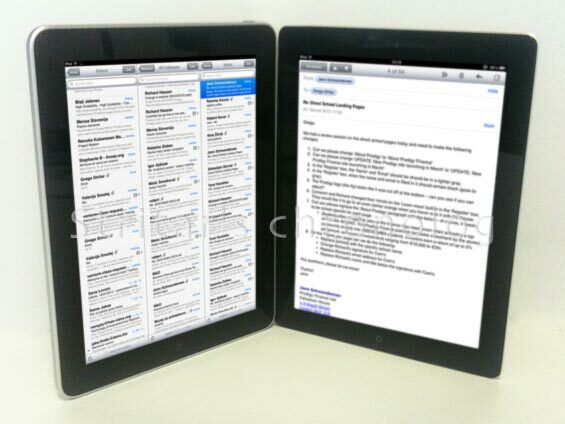 What would be better than having two apps on two iPads, with copy-paste and other cross-functional support? Like combining books and notes? Real multitasking on two integrated iPads, using the iBooks and Notes. We've already seen quite a few promising prototypes of book-shaped tablets, but I'm not sure if any of them made it to production. As shown on the second mockup, which displays different mailboxes in a TweetDeck type-of form on the first, and the emails on the second screen, this kind of use could prove itself very much useful. Mailing like a pro: mailboxes on one screen, emails on the other. At this point, the iPad is still not a full replacement for a personal computer, because of its hardware and software limitations. But it does support remote desktop connections to a computer, behaving as a terminal. Very cool, but not that useful, since it's hard to control a computer using a touch screen. By integrating two iPads into a laptop, we suddenly receive a keyboard and a trackpad, making such tasks much easier. Add a few more features to the iOS, and you could have a full replacement for a laptop. 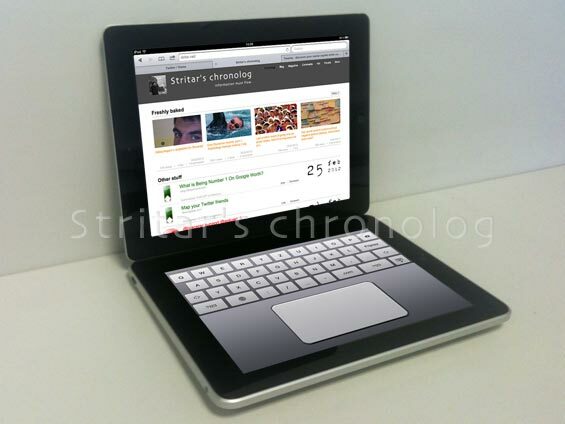 Something similar to the Asus Eee Pad Transformer or the Acer Iconia laptop concept? Combining two iPads into a fully working laptop. Hardware: Easy. Something similar to the current magnetic sleeve which would hold the two iPads together. A cable wouldn't be needed, since connectivity could be done by wifi or bluetooth. Software: Hard. Enabling one iPad to become a server and another one to become a client, being able to access and control the apps of the other. Merging two iPads wouldn't be easy and probably not as useful as imagined in the mockups, since the user experience and controlling would have to be completely reinvented to support dual screen mode. 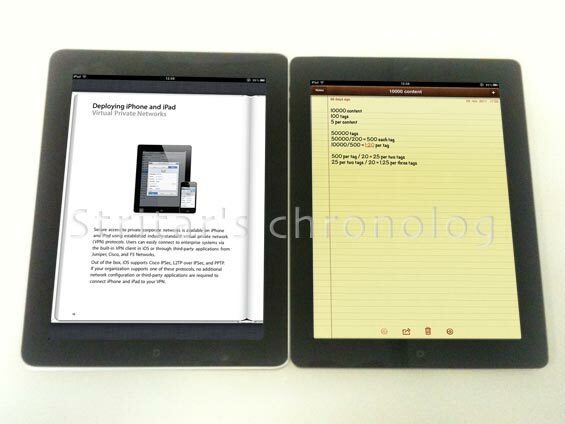 Besides, if you would combine the iPad 1 (around 700 grams) and the iPad 2 (around 600 grams), you would get a 1,3 kg beast. Not very promising, but still not perfectly useless (the current 13' MacBook Air weighs 1,35 kg). But the idea surely does hold potential. There could be even more interesting uses of such an installation, I've only outlined a few of them. So Steve Tim, if you like the idea, feel free to make it work. I would be more than happy to test out the MacBook Pad concept with the complementary iPad 4. Special thanks to betmenka for lending me her iPad 2 despite being in a real hurry. Did Apple and Samsung just pull the greatest trick in the mobile universe? This lawsuit is probably the most effective piece of marketing Apple and Samsung have ever done. In the time that everything goes social, the most social device got left behind. Force Touch (3D Touch) on the new iPhone promises to change the way we interact with mobile devices. As A teacher, having used both macbook air and windows laptops and real tablet pc ( stylistic 6012 8gb ram,128ssd wacom digitizer, stylus ) I lack the ability to display 2 different contents, one on the ipad screen, one on the videoprojector. I use that all the time to recap or mindmap with students. That's what preventing me from buying the ipad pro. The 2 ipads was another possibility ( an ipad 1 and another, say ipad air, both second hand, giving you 300 400 for a setup). I have played with duet app and the apple tv: no use when your school only gives you rj45 network, not wifi.